Is Scroll.in a nest of Adarsh Liberals? An intrepid investigator goes through a checklist available on Twitter to crack the crucial question. I was asked to do a piece, which makes fun of Scroll’s Adarsh Liberal nature, for April Fools’ Day. This set me thinking. Why just on April Fools Day? Are they not funny on other days? Or are they trying to designate or specify the periods when we should mock them? Will it be bad manners to mock them on April 3, for example? My personal feeling is that once a year seems too little. Perhaps we could settle on Thursdays. I don’t tweet much, so I’m afraid the whole Adarsh controversy passed me by. Initially I thought that an Adarsh Liberal was someone who avoids non-veg and cherishes minorities, but a little bit of research showed that this was not the case. Many of us remember the Adarsh Balak from our youth. He was the one our mothers were always referring to, saying why can’t you be more like him? He was brushing his teeth regularly, and helping old ladies across the street. He was studying constantly. He had no pimples. Often he indulged in healthy outdoor activities. He was sickening. The textbooks never revealed his address, so we were unable to go across to his house and beat him up. He was such a loathsome creep that none of us ever stopped to consider a very crucial point – what are his political views? This has now been revealed on Twitter. His evolution has been rapid. Like many public figures who we know and love, he seems to have flipped over from being an Adarsh Liberal to an Adarsh Sanghi with frightening speed, and without even changing his clothes. It’s quite possible that he was swept up in the BJP recruitment drive. But first, let us examine his original political position, which is what brought him back to haunt us. What exactly is an Adarsh Liberal? Your genuine Adarsh Liberal has specific characteristics, most of which are from Fab India, or look like they might be. Nowadays, some are avoiding the clothing, as this is becoming too obvious, and makes them easier to identify at cocktail parties. This is why Fab India has diversified into things like soap and moong dal and bookshelves, so that Adarsh Liberals can stay true to their roots without revealing themselves to the public. It’s also much more profitable. Have you seen the prices of moong dal at Fab India? For the same price, at other shops, you can buy both the moong dal and a bartan to cook it in. They haven’t even bothered to call them lentils, which at this price point is more or less expected. What are the other characteristics of Adarsh Liberals? They usually speak English very well. Does this mean that everyone who speaks English very well is an Adarsh Liberal? Not necessarily, I saw a BJP man called Nalin on TV. He had no hair, but his accent was terrific. Adarsh Liberals also attend conferences and seminars, where they spend most of their time agreeing with each other. Sometimes romance blooms. Eventually they produce smaller Adarsh Liberals. Around the age of four, for the first time, the child steps into Fab India. So is Scroll a nest or hotbed of Adarsh Liberals? Questions have been raised, but proof is required. Unlike other writers, who tend to be lazy, I try to give readers authentic facts. Hence I did research. I sent the editor Naresh Fernandes and senior editor Shivam Vij detailed questionnaires, but they did not reply. This is suspicious. Most probably they don’t want to incriminate themselves. They also realise that they are vastly outnumbered. The BJP now has 10 crore members, thanks to a widespread realisation that saying no to Amit Shah is never a good idea. Some reports indicate that the mere receipt of an SMS from Amit Shah automatically makes you a member of the BJP. It’s like when the Pope touches your forehead with his finger. This fear of encirclement could explain why they are not coming clean, and ignoring specific questions from responsible members of the media. Even if they refuse to confess, their actions can provide us with clues. I went through the checklist provided by Twitter. Does Scroll support PETA? There is no evidence to show that it does. I looked for pictures of Naresh, naked and covered in vegetables, but luckily I could not find any. How about the victim card? Do they play it frequently? Only when you ask them for money. But so does everyone else in Delhi, so this evidence is not conclusive. Does Naresh brush up his lies every morning? I know he gets up at five o’clock. I can think of no other reason. In the middle of all this, what is an Adarsh Balak supposed to do? The country is highly polarised, and you may end up getting it from both sides. On the other hand, the current administration could eventually be replaced by a new administration. The scenario could change completely. All government schemes could once more be re-named in English. It’s best to keep everyone happy. Be kind to both cows and minorities. Buy one or two items from Fab India. Memorise passages from Mann Ki Baat. Buy a small photo of Nehru. Donate for a statue of Godse. See what Chetan Bhagat is doing. But whatever you do, do not delete messages from Amit Shah. And if he asks you for a missed call, don’t delay more than 5-10 minutes. 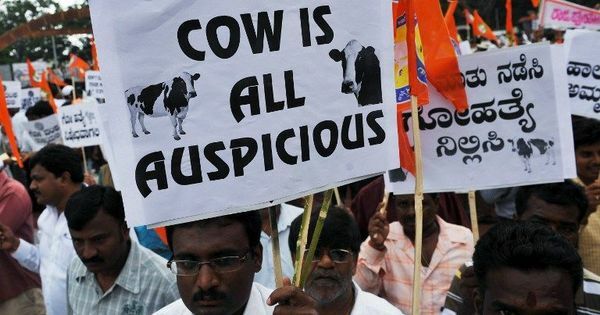 An Indic dilemma: Should you be drinking cow urine?